It begins like so many things, by initializing the GPU. We will be communicating with the GPU via mailbox, by writing one word with the 16 byte aligned address of the commands we want to send to the upper 28 bits, and the destination mailbox channel in the lower 4 bits. We wait for the GPU to reply by polling the MAIL_STATUS register until MAIL_EMPTY bit is no longer set, and then we keep reading from the MAIL_READ register until the fifo is empty, being careful to check the lower four bits of the response for the expected channel. The GPU will return a message of 0x80000000 on success. While getting the VC and ARM memory sizes and offsets are not necessary for initializing the framebuffer, its fun stuff to know. So after running these mailbox tags and waiting for the GPU response, the address and size of the framebuffer will be written to fb_ptr and fb_size respectively. This brings us to the real core of today’s entry: command buffers. Even a high level overview has so much to cover, so this is going to have to be another multi-part post. Today I’m focusing on the front end’s two threads: binning and rendering. The binning thread is responsible for setting up the tile binning mode configuration, supplying blocks of binning memory for the render thread command buffers, and specifying state data, shaders, and primitive lists. The rendering thread then goes through the commands generated by the binning thread and… well… renders stuff. 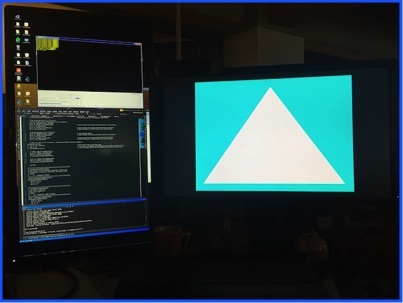 Ignoring the semaphore for now, we have a Clear_Colors command with the color 0xFF00FFFF, a Tile_Rendering_Mode_Configuration to set up the framebuffer address, screen dimensions, and color format, and finally our macro to generate all the per-tile branches. That 0x00000000 in Tile_Rendering_Mode_Configuration is for the framebuffer address, but since we don’t know the address at assemble time we have to patch it in after initializing the GPU and setting up the framebuffer. Again, don’t forget to flush so the patched in framebuffer address is visible to the GPU. Most of this is pretty self explanatory. We’re setting some state, starting binning, and flush when done. That semaphore only increments when binning is done and everything is flushed, so if you put it after the flush it would never increment. The two most interesting things in this command buffer are the binning mode config and the NV shader state. TILE_ALLOC_ADDRESS and BIN_MEM_SIZE are the address and size of the memory pool the binning thread uses to create render command buffers. In experiments allocation block size seems to be 32 bytes, and the remaining size can be read from the BMPRS register. Out of memory conditions can be handled with an interrupt. TILE_STATE_DATA_ARRAY_ADDRESS is the address of the tile state data. Don’t worry too much about that frag shader, as I have another post coming up that dives deep into the details of writing them. So now we have built two commands buffers, but how do we submit them? The GPU has two registers per thread, one for the command buffer start address and another for the end address, and execution continues as long as the start address and end address are not equal. For binning thread 0, these are CT0CA and CT0EA respectively. Likewise for render thread 1, it’s CT1CA and CT1EA. There are a few ways of synchronizing the threads. If you’re lazy you can have the CPU wait on BMFCT which is incremented when the binning thread flushes all tile lists to memory. When when the count is right you can let the CPU go on to kick the rendering thread. On the other side RMFCT is incremented whenever the last tile store is completed. Making the CPU spin wait on these is probably a very bad idea for performance. Slightly better is kicking the rendering thread when a binning flush interrupt happens. An even better way is to use semaphores (see above). There seem to be two front end semaphores, one that the render thread waits on and the binning thread increments, and another that the binning thread waits on and the render thread increments. This is a great way to stop either thread from getting too far ahead of the other. There are also markers, but that’s a topic for another day.